The United States Congress designated the Unimak Wilderness (map) in 1980 and it now has a total of 910,000 acres. All of this wilderness is located in Alaska and is managed by the Fish and Wildlife Service. Huge Unimak Island, which gives this Wilderness its name, extends west from the tip of the Alaska Peninsula. Only a relatively thin strip of sea separates Unimak from Izembek National Wildlife Refuge. About 93 percent of Unimak Island has been designated Wilderness. Here you'll see the nearly perfect cone of Shishaldin Volcano, the highest cone in the Aleutians. At 9,372 feet, it served as a navigational aid first for Aleuts and later for Russian seafarers. 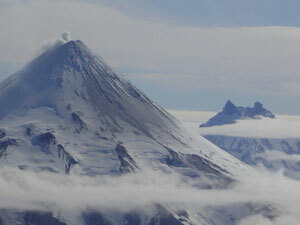 Shishaldin and two other Unimak volcanoes are active, surrounded by extensive lava flows and fields of bare ash. On the highest peaks of the island lie perpetual snowfields, some covering glaciers. Fisher Caldera has gone dormant and is now filled with icy water. The coastline features steep bluffs with many offshore sea stacks where seabirds and marine mammals may be seen frequently. Near the shoreline, wetlands provide nesting, feeding, and resting habitat for waterfowl and shorebirds, including whistling swans, geese (Canada, emperor, and black brant), sea ducks, mallards, pintails, gadwalls, green-winged and common teal, common goldeneyes, and greater scaup. Brown bears have migrated to Unimak, swimming from the mainland and living near caribou, wolves, and wolverines. The coast of Unimak offers sea kayaking possibilities, and the interior, although typically wet and virtually without trail, provides an opportunity to hike across rolling tundra and treeless grasslands, a wild and lonesome land. Carry a stove and plenty of fuel; firewood is scarce away from the driftwood-littered shore. Planning to Visit the Unimak Wilderness? How to follow the seven standard Leave No Trace principles differs in different parts of the country (desert vs. Rocky Mountains). Click on any of the principles listed below to learn more about how they apply in the Unimak Wilderness.